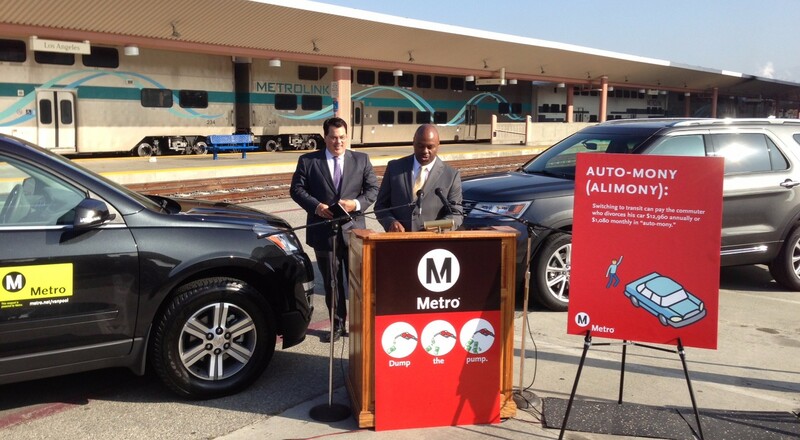 Phil Washington (left) and Shawn Nelson encouraging driving commuters to dump the pump. Photos by Joe Linton/Streetsblog L.A.
Washington emphasized that while driving is promoted as being associated with freedom, the reality differs from the image. Nelson emphasized that riding transit avoids the “white knuckle” stress of driving, and instead gives commuters time to read, text, or just spend pleasant time alone. Divorcing one’s car saves commuters an estimated $1,080 each month in car costs including: gas, insurance, maintenance, parking, and depreciation. Dump the Pump Day is a national initiative of the APTA, the national trade organization where Washington currently serves as chair of the Executive Committee. In a conversation with Streetsblog L.A., the Metro CEO emphasized the importance of APTA in bringing transit agencies together to meet industry challenges. Washington expressed enthusiasm for APTA’s recent strategic plan to respond to five key mega-trends: safety/security, funding, demographic shifts, workforce development, and technological innovation. 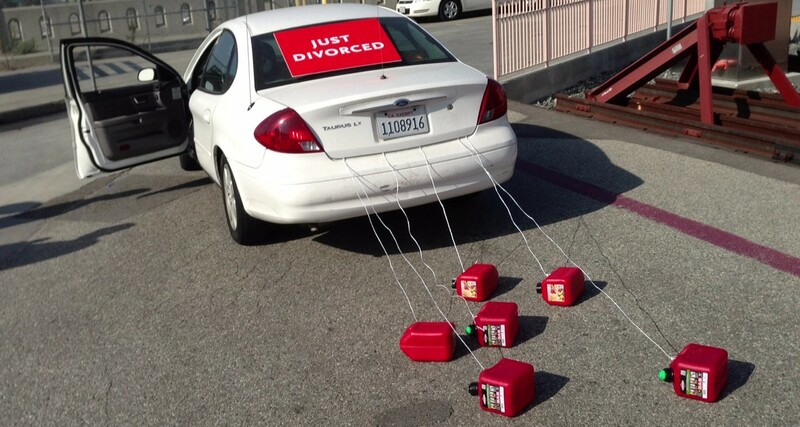 It’s a clever slogan “Divorce your car”, but it ignores the point of view that for many, if not most, of us, it’s a “marriage of convenience”, not a “love affair”. Some years ago, I wrote an article about why the owner-operated motor vehicle came to dominate our local passenger transportation system. I posited that the car appeals to some less than praiseworthy human characteristics: Impatience–Americans are a notoriously impatient lot. We don’t want to wait for a bus or train, we want to hop in and GO! Selfishness–we don’t want to share our space or ride. Our errands and trips are much more important than anyone else’s. We don’t want to stop while other people get on the bus or train. Laziness–unless you live next to a bus stop or train station, you have to factor in the time it takes to walk to the boarding area. Unless you’re disabled, it may not be that much of a nuisance, but if you have to carry something, it gets heavier by the block. For some drivers, we can add: Snob appeal–buses are sometimes called “loser cruisers” because bus riders are thought to be too poor to afford even an old clunker. One auto maker even comes right out and says, “You are what you drive”, and others tout itheir “aggressive stance” or “luxurious interior appointments”. For an “auto snob” being seen driving an “appliance car” would be the ultimate “bringdown”. No argument with these points, but as my lease concludes on my car with “luxurious interior appointments”, it’s looking more and more like we’re going to become a car-free household. In my case, while it’s often convenient to have a comfortable car and my beck and call, what good is having one if I hardly need to use it? I live adjacent to a Metro station and half a dozen ZipCars (including a couple luxury vehicles) are located within a stone’s throw of my residence. For Angelenos debating whether to take the leap to a car-free or car-light household, I think the key is to take transit convenience into account when debating a new residence. Don’t expect Metro to build a station in your area (unless one is already planned). Instead, move to an existing Metro station-adjacent area. These days there are both affordable and expensive neighborhoods located near Metro stations. Anyway, unsolicited advice distribution complete. Does getting around 75% of my needs on a scooter count as going car-free? I do it to mainly save on gas and at times, it’s actually quicker to get around especially in gridlock. HAHAHAHAHAAAA…… Dump the Pump, like these guys pictured didn’t use the pump to get there! Really if you want to do some blogging here, why don’t you show these “officials” getting to work in their 4-wheeled cages? Would make a far more interesting story here. Really since I’m on the subject, how bout showing these “officials” promoting our public transport, getting to work each day? I’m betting a LARGE percentage never even use the public transport. Funny cause to classify “using the public transport” is using it once a year or more. I’ve got a sad feeling that many wouldn’t even make that cut! Well, I’d love to see more electeds and agency staff ride transit… but that day Shawn Nelson made a point of saying he had ridden Metrolink to get to the press conference. I haven’t heard about what he’s doing in L.A, yet, but in Denver, Phil Washington made a point of riding transit – and advocates mention running into him on the train there… so these two “officials” probably did “dump the pump” to get there that day. Urban design is the key factor in how feasible public transit is. The density has to be there to support frequent service. Another key factor is where your job is. If your job is in a place with crappy transit, you’ll be hard-pressed to get there on transit, even if you live in a place with good transit. Awesome! Out of how many “electeds and agency staff” are we talking about? Really compared to the rest the world our carbon footprint per capita is so much larger and out of whack. Just to get it down to be about like the rest of the world would have these “electeds and agency staff” having a Dump the Pump day everyday! And that’s just to get it down to average. Don't let anyone tell you a healthier economy is inextricably linked to more driving.